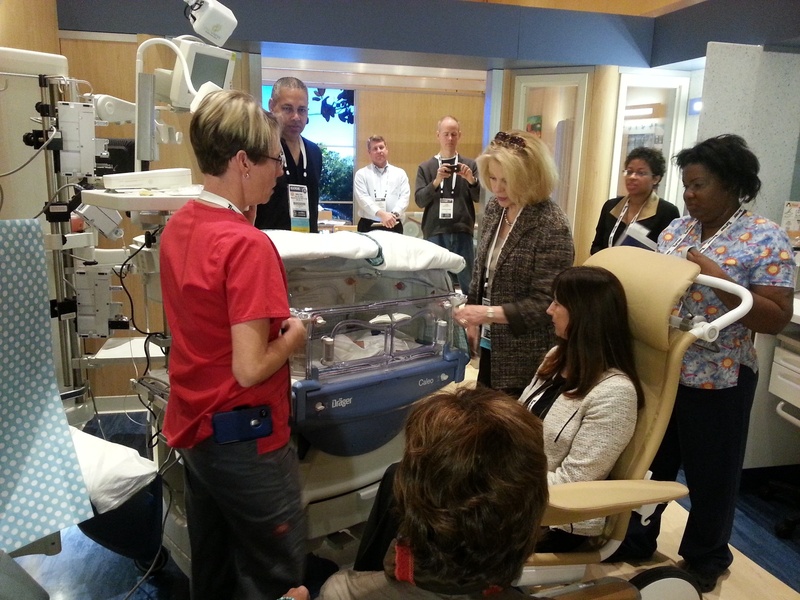 In 2015, Visa Lighting and a few other manufacturers partnered with the Institute for Patient Centered Design to create the Neonatal Intensive Care Unit Simulation Lab. This full-scale NICU patient room and waiting area was built to demonstrate best practices in NICU design. Visa Lighting focused on the effects of lighting for neonatal patients, family, and hospital staff. By analyzing information gained in this simulation lab, we have refined our understanding of the importance of patient centered design in hospital lighting. This article will cover what we've learned about NICU environments and tunability, comfort, elements of nature, artwork, exam situations, and surface cleanability. Tunable lighting (warm-to-cool color temperature change that mimics the outdoors and varies with the time of day) is often used in healthcare environments to regulate patient sleep patterns and provide comfort. In many situations, allowing patients independent control of their surroundings means they can respond and adjust to their environment. This aids in the healing process. However, there are some applications in healthcare where the patients are not able (or in this case are too small) to control their environment themselves. Simple automatic control systems can be designed with small changes to the environment, yet have a large impact. In the NICU simulation lab, self-tinting windows were installed with integrated shade systems. Lighting controls that can dim in the morning and night or adjust and respond to daylight were also in place. Research has shown that day/night cycled lighting that varies the intensity of light with the time of day aids in giving visual cues to keep our circadian rhythms on track. In particular, the increase or decrease of the amount of light in a room has had significant effects on neonates as well. Kangaroo Care (or skin-to-skin contact) is vitally important in a NICU setting. Kangaroo care helps parents bond with their child and promotes healing and comfort. Research shows that babies who are held close to their mothers' bodies for large portions of the day not only survive, they thrive. In the NICU simulation lab, a chair is placed close to the incubator to support Kangaroo Care. This allows the neonate to be monitored with the nearby equipment while permitting their carer to perform skin-to-skin contact. Like purposefully placing furniture, lighting also contributes to the overall comfort of a space. Design strategies that incorporate amber LEDs in sconces bathe the room in soft, warm light (instead of the bright, harsh white light that is often associated with a healthcare setting). Logically, a dimly lit room is an easier place to calm a newborn. Lighting with the ability to dim creates a softer environment while allowing a parent or staff to see at night. The use of amber LEDs along with dimming controls can make all the difference to a newborn. The warmer wavelengths of amber and red LEDs do not disrupt sleep cycles as much as the whiter/bluer wavelengths of light in our visible spectrum. These warmer wavelengths permit a mother or father to provide comfort without disrupting the sleep cycle of a sick infant. Small changes to the hospital environment can have a large impact. Access to daylight and views to nature are not only important but, according to FGI Guidelines, are mandatory in healthcare settings. There must be accessible daylight for patients, families and staff. Providing views of nature can help relax, motivate and heal patients. However, simply designing for windows isn't enough. Reflections, glare and heat gain from windows can have a negative impact and should be seriously considered during the design phase. Glare may be uncomfortable enough to an adult, but to a baby it can actually cause harm. A neonate's eyelids, specifically when premature, are much thinner and are still developing. Special attention to glare and high light levels from natural and artificial lighting needs to be considered. Indirect, diffused light sources should be used when possible. Lighting that can be easily dimmed or integrated with automatic controls or time clocks should be used in a NICU setting with override controls for transillumination. Finishes that reflect glare easily or light, bright surfaces should also be reconsidered. Research tells us that artwork in a healthcare setting has calming effects. Whether it’s trees in the wind, a canopy overhead with sunlight coming through, or soft landscapes, natural elements can help comfort patients, family and staff. For the last few years, Visa Lighting has been working with the artist Vara Kamin. Her work has shown that soft, soothing colors and non-representational images can provide a visual distraction or comfort in a healthcare setting. In the NICU simulation lab, we used artwork as a backlit feature in the hallway adjacent to the family area. Family members as well as staff who walk through the hallway are all greeted by a beautifully lit piece of artwork the instant they walk through the NICU pod. The idea is that the family and staff can enter the space feeling slightly more calm in what is otherwise a very stressful environment. In a NICU setting, equipment that reaches over 200 foot candles should be used for examination. As we’ve discussed, the use of indirect light or diffused light to mitigate glare is a must. The equipment used behind the incubator in the NICU simulation lab has integrated uplight just for that reason. Facilities can also install headwall equipment designed to include that type of lighting. Next to the bed, nurses and staff must be able to use 1-60 foot candles for task and minimal exam. Instant room darkening for transillumination should be available. Surrounding nurses stations should also have adequate task lighting. In the NICU simulation lab we’ve provided a vanity light for over the sink and counter area that not only gives off enough task light but can also be switched to an Amber LED when needed. Amber LEDs provide warmer light at night allowing nurses to check on the infants without turning on a white, bright light. All surfaces in a healthcare setting should be easily cleanable, with special attention paid to surfaces in contact with people or movable equipment. Surfaces should be free of substances known to be teratogenic, mutagenic, carcinogenic or otherwise harmful to human health. Eliminating edges where dust collection may occur or the ability to reach surfaces should also be considered. The NICU simulation lab lighting was designed with clean, flat surfaces and anti-microbial finishes where feasible allowing and to promote cleanability. Hospital acquired infections are the leading cause of infant deaths in the NICU. As designers, it is our responsibility to aid in the cleanability of our patient room designs. Attention to finish, fixture and equipment selection is a must. As a standard, Visa Lighting’s overbed patient room fixtures come with anti-microbial finishes. The simulation lab, currently located in the Nexxspan Healthcare space in Atlanta, has become a great feature and tool for learning. As lighting designers and representatives, we have a duty to pay close attention to NICU design, lighting and our actions. We need to take responsibility and continue to develop true healing environments that promote health and wellbeing for all ages. More information on the Institute for Patient Centered Design.